Lois Clary's life revolves around her job as a software engineer at a hip tech company specializing in robotics. Her only non-work interaction is with the brothers who run a local restaurant; she talks to one on the phone when she orders and sees the other when he delivers her food. She adores their spicy food and sourdough bread, but her happy dinners come to an abrupt end when the brothers have to leave the country. 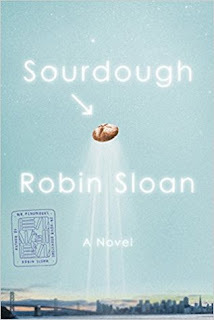 They come to say goodbye and leave her a strange gift--their sourdough starter. Lois learns to bake and soon she is baking bread for her company's cafeteria and then for an underground farmer's market that combines cooking and technology. Lois' routine life is about to become very surprising. This is my second foray into a Robin Sloan novel and I had a wonderful time reading both books. They are heartfelt, quirky, and smart, and I love the way that Sloan looks at both the limitations and promise of history and technology. This story is like nothing you've ever read before and the author will take you on a wild and really fun ride, while subtly making you think about what makes a good life and whether tradition and technology can live together. Lois herself is a great character, but Sloan really goes to town in creating his secondary characters which include a group of women all named Lois, a haughty restauranter, a man who herds goats and makes radioactive cheese, and a bibliophile who only collects books about food. There is a bit of magic that lives in this book and in the sourdough starter; it occasionally goes a bit too far but mostly makes for a delightful addition to this story. Now while you go get this book, I'm off to bake some bread. It's perfect for exactly that! Sometimes you just want a bit of fun book that reminds you why you love reading. I'm really looking forward to picking this one up. I loved Mr. Penumbra, and I've been happy to read all the good reviews of Robin Sloan's new book. Glad you enjoyed it! It's so nice when an author has multiple wonderful books, isn't it? Oof, now I would like some sourdough too! :P The underground farmer's market sounds like an intriguing concept.